The stylish new Stuart Undergrad Hotplate Stirrers are designed to enhance ease of use and safety in the laboratory. They incorporate unique features, such as a power-independent hot warning light and an LED indicator of the hotplate surface temperature, which help create a safer working environment. 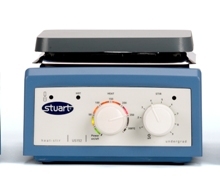 The Undergrad range from Stuart includes combination hotplate stirrer models as well as dedicated hotplates and stirrers. All the heating models are compatible with the Stuart SCT1 temperature controller and automatically detect when the controller is plugged in. An LED temperature indicator surrounding the heater control knob on the Undergrad hotplates illuminates progressively to indicate the actual surface temperature. This provides a conspicuous visual indication that the unit is hot and also clearly differentiates the heat and stir controls. In addition, a `hot' warning light flashes once the hotplate surface reaches 50°C and continues to do so while the unit is hot, even if the unit is switched off and unplugged.